This is similar to a standard remote issue link, but has some advantages, and disadvantages, versus an issue link. Create a new field via Admin → Script Fields. Note that although you can create these types of field via Admin → Custom Fields, you cannot configure them there so it is easier to do it through the ScriptRunner interface. You can preview the result…​ but note that if you are previewing before creating the field, you will not be able to see a preview of the view output as no issue will have a value for this field. Previewing is useful to verify that the picker is only displaying the correct candidate issues. After creating the field ensure it has the correct context and the correct screens. In this release you should ensure that the people who can edit issues with this type of field also have permission to view any linked remote issues. In a subsequent release we will improve this. You can search for issues by prefixing the app link name. It’s probably easiest to do this using the basic search interface, then switching to advanced mode as necessary. "Public Issue" = "Remote Instance:AAAA-10"
You can also use the IN, !=, NOT IN operators. You must provide the fieldConfigId number as shown above when using IssueService. This is because Jira doesn’t let us accurately retrieve the Field Configuration, which we need for retrieving the configured parameters of the field. 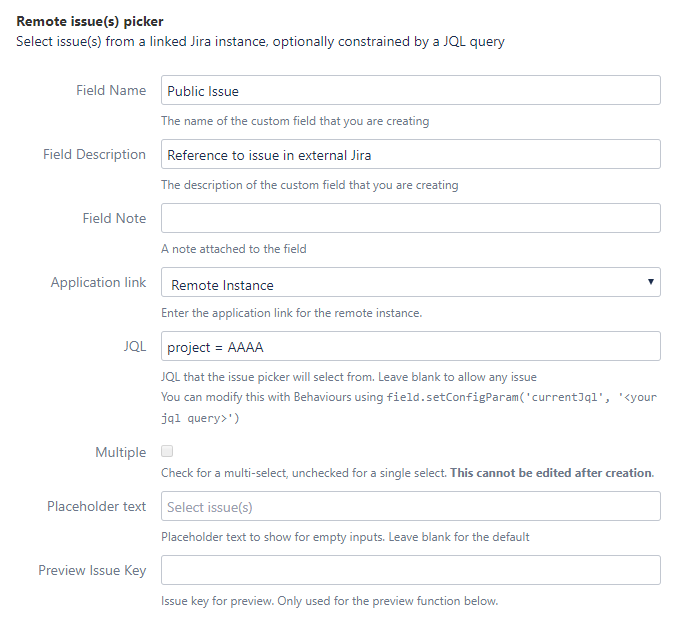 If you retrieve or set the value directly on the issue, the result will be a com.onresolve.scriptrunner.canned.jira.fields.editable.remoteissue.RemoteJiraIssueReference object, or if you have chosen a multiple issue picker, a Collection<RemoteJiraIssueReference>. RemoteJiraIssueReference is a simple object with the following properties: id - the issue ID (not key) of the remote issue, and appId - the application link ID (not name).